The antiquity of writing in India stretches back to the period of the Indus civilization which lasted for about eight hundred years from 2500 to 1700 B.C. After a gap of over a thousand two hundred years we come across inscriptions of Asoka in the Greek, Aramaic, Kharosthi and Brahmi scripts. Brahmi was the most common script used by Asoka who ruled from 269 to 232 B.C. Brahmi inscriptions which belong to the period of Asoka have been found even in Sri Lanka in rock-shelters. The language used in the Brahmi inscriptions of Ceylon and those of Asoka is Prakrit, a colloquial form of Sanskrit. Inscriptions using Brahmi characters have also been discovered in Tamil Nadu in rock-shelters and potsherds of different types, and the language used is Tamil with a mixture of Prakrit words. The earliest writings so far discovered in Tamil are written in characters which closely resemble Asokan Brahmi inscriptions. The language of these inscriptions is a peculiar kind of Tamil and not really the classical Tamil of the Sangam poetry. 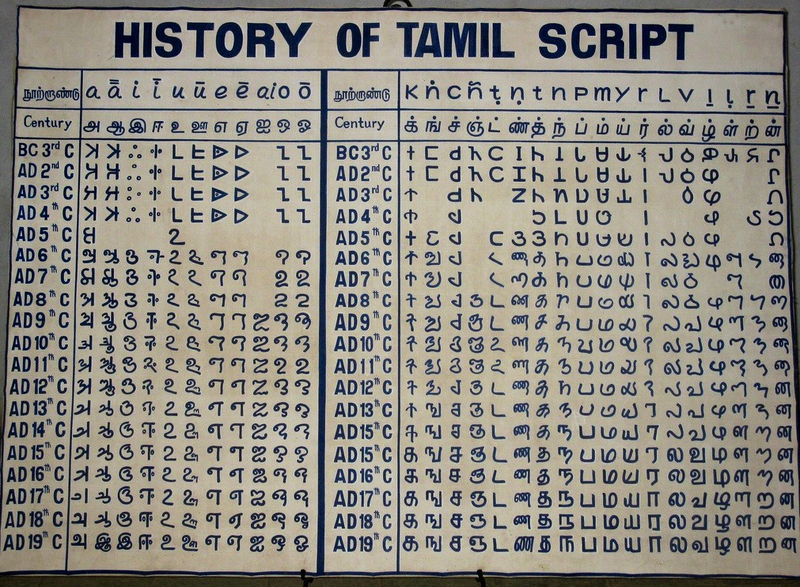 Both the modern Tamil script and the Vatteluthu script evolved from this parent script. 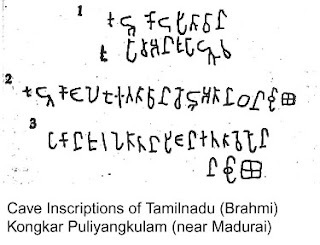 No other script earlier than the Tamil-Brahmi (also called the thamizi or Tamili) script has so far been discovered in Tamil Nadu. Some scholars assumed that the Asokan Brahmi is the parent script from which all the modern Indian scripts evolved over many centuries. However there is no unanimity of opinion about the origin of this parent script. It is either an indigenous script or a script borrowed from outside the country. If the script were to be of indigenous origin then it could have developed from the Indus signs. When was the Asokan Brahmi script designed? Megasthenes the Greek envoy who visited the imperial Mauryan court around 300 B.C. is said to have observed that Indians [or north Indian] did not have written books, implying that they did not use a writing system or writing was not widely prevalent. Archaeological excavations in pre-Asokan sites have not brought to light earlier forms of Brahmi; and Brahmi itself appears rather suddenly on the scene as an elegantly designed script. It is quite likely that the northern Brahmi came into usage some decades before Asokan rule -- i.e. the beginning of the 3rd century B. C. From where did the inventor get hold of so many different signs? It is very clear, Asokan-Brahmi and the Tamil-Brahmi scripts could not have been designed independently by two different groups unknown to one another and come out with more or less the same set of symbols for the same set of sounds. Either one is directly influenced by the other or there was a common source from which both Tamil in the south and Prakrit in the north borrowed. 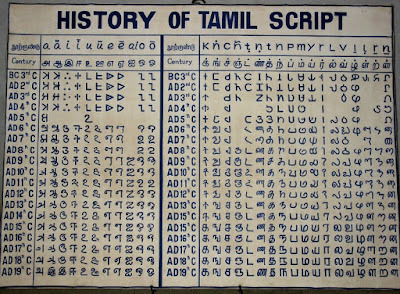 Tamil was committed to writing for the first time using a modification of the Asokan-Brahmi script. But,The Mahavamsa, the Buddhist chronicle of Sri Lanka speaks of a monarch, King Vijaya of the fifth century B.C. having sought matrimonial alliance with a Pandya ruler. The ancient Pandya ruler is said to have sent a letter to Vijaya along with his daughter. 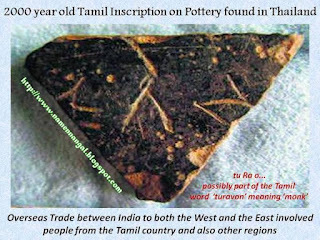 This reference to a letter could indicate that writing existed in Tamil Nadu for many centuries before Christ and even before Asoka .